This is our first weekend in our new home and with very few plans so it was nice to have a lie in (or two). Saturday was day 6 and I decided to deviate from the meal plan at breakfast but stick with the principles and have smoked salmon, scrambled eggs (cooked in a little coconut oil instead of my usual slab of butter) and avocado on toasted rye bread. This is a regular weekend breakfast for us except we'd normally have have a couple of nice buttery slices of wholemeal bread. I hadn't missed bread at all this week until then, despite the rye bread being a perfectly tasty substitute. Yesterday afternoon we popped out for a bit of shopping and then caught up with some friends for coffee. This was my first time in a coffee shop since I started the detox and I was a little anxious about it and planned to only drink water. 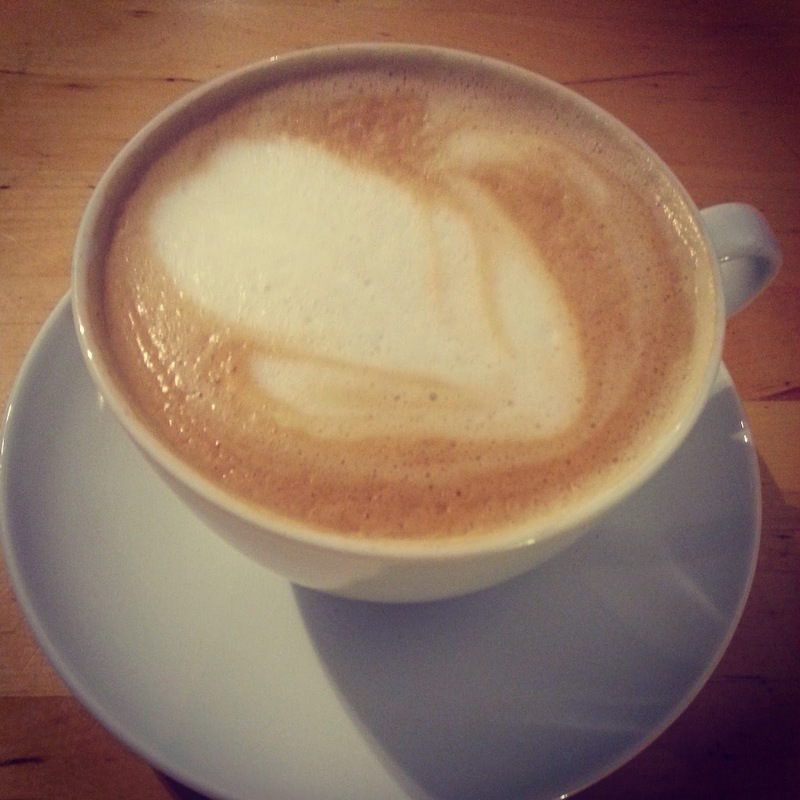 However, when we got there I opted for a decaf latte with almond milk which sated my palate if not my caffeine craving. We also found a fab and bustling food market on our ventures and picked up a huge punnet of peaches for £1, and some juicy figs which were 5 for £1 but as it was closing up time the chap gave me 8. Late in the day is definitely a good time to visit a market! Dinner yesterday evening was my favourite so far. 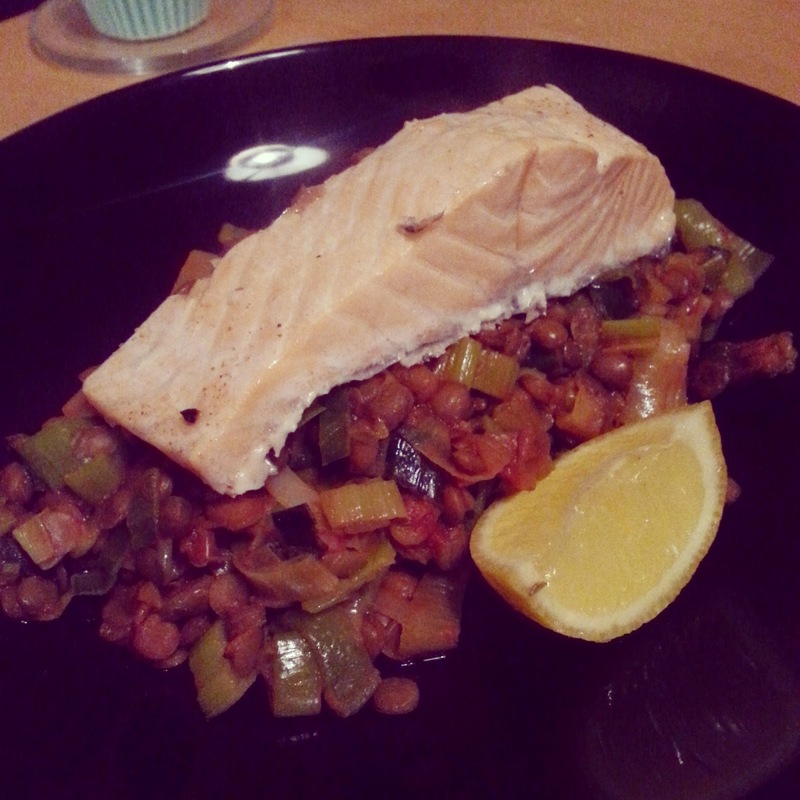 A mix of sweated leeks and green lentils cooked with onion and garlic then topped with a steamed salmon fillet. I love fish and even beyond this plan I want to make an effort to eat more of it. This was absolutely delicious and really quick and easy to cook, especially with canned lentils. I'll definitely cook this again. I have noticed that despite my anxiety from the past few days, I do feel that I am sleeping better and waking feeling a lot more energetic than I have over the past few months. On Sunday morning (day 7) I even got up and suggested we go for a run first thing. AND THEN WE BLOODY WELL DID IT! I figured a run would be a nice way to explore the streets around our area then unfortunately I led us down a road which turned out to be a massive hill. Fine on the way down, a horror show on the way back up. This is the first time I've run in about 2 years so I'm hoping I can keep it up. I'm also hoping to find a local yoga class to join soon. 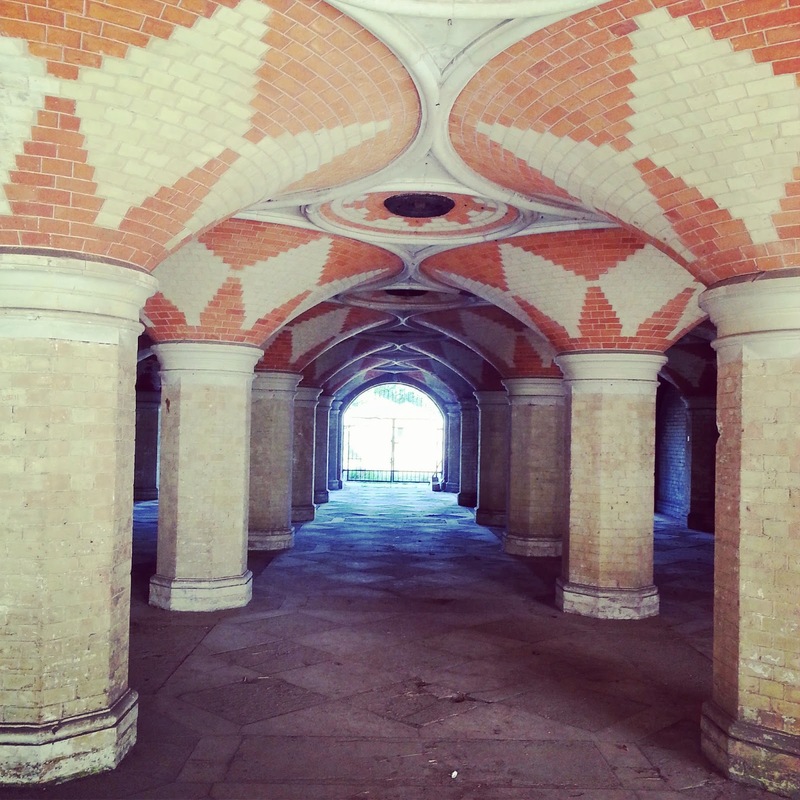 Post run I had some fruit and seeds for breakfast and then popped out to visit the Crystal Palace subway with some friends. The subway was abandoned 60 years ago and is now closed to the public but was open for tours this weekend as part of Open House London. It's an absolutely beautiful piece of architecture and I feel lucky that I was able to see it. Once I got back I made a recipe called "Cleaning Bean and Artichoke Salad" which made my boyfriend laugh a lot because "cleansing" clearly has certain connotations! 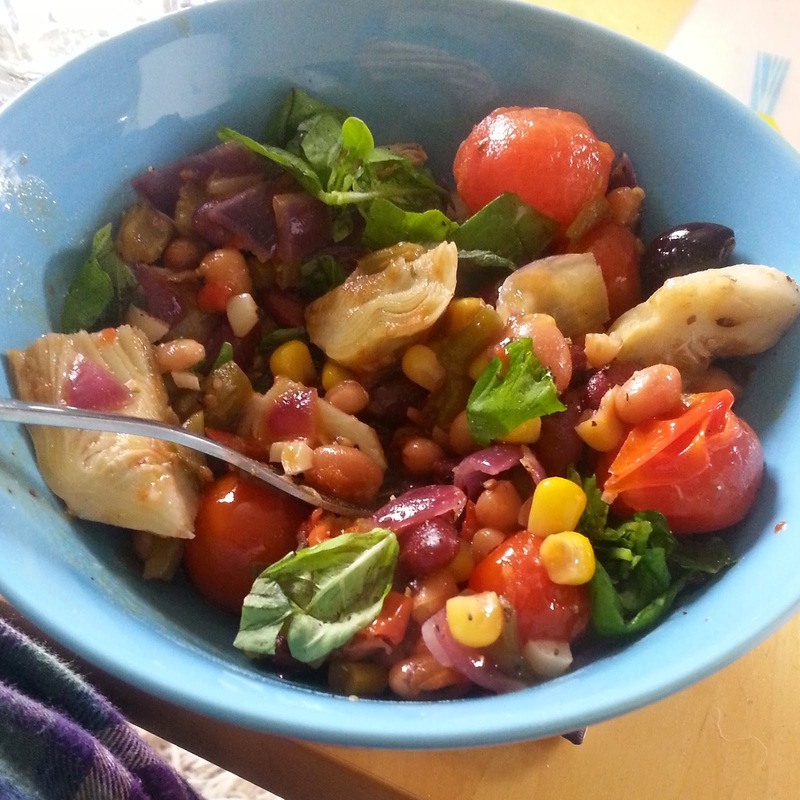 This wasn't so much a salad, more like a stew made with mixed pulses, cherry tomatoes, chopped artichoke hearts and lots of fresh basil. Once again, this one is a winner and I've made extra for lunch tomorrow and will definitely have it again and again. Despite milk being banned from this plan, there is a recipe in this book for a berry frozen yogurt made with live bio yogurt, which still contains milk. I was a bit confused by this but decided to have it anyway and see how I got on. I felt absolutely fine when I was eating it but did notice than my stomach felt quite rumbling afterwards. I'm not sure if this is an intolerance to milk, but I'll be keeping an eye on it once the plan is over. 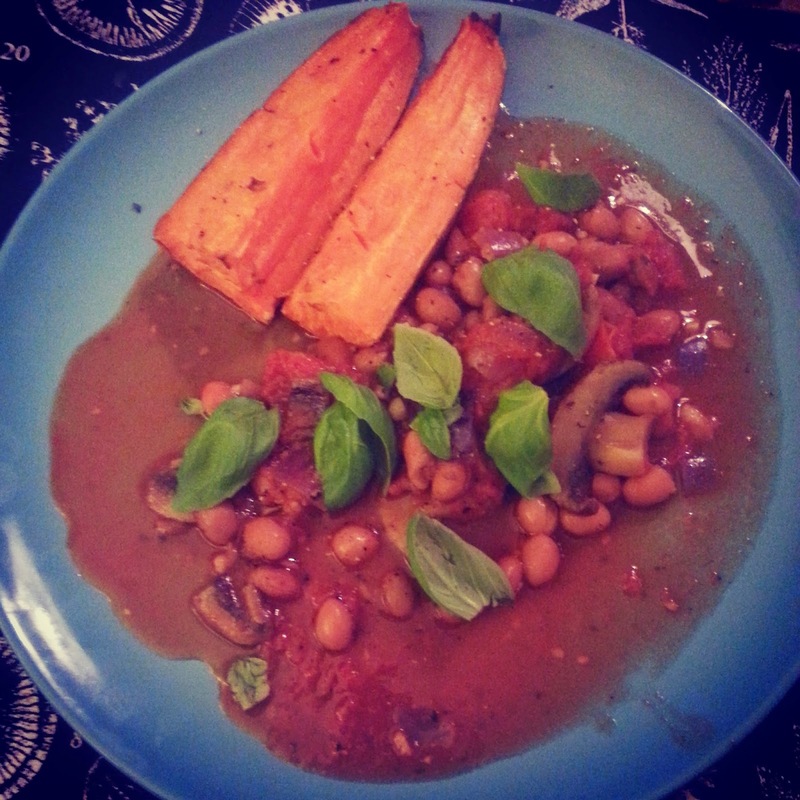 Dinner this evening was actually quite similar to the lunch, a borlotti bean and mushroom stew with baked sweet potatoes. I'd had lunch a little later than usual so didn't have much of an appetite for this but still managed a reasonable portion. There are leftovers so I think I'll just have this for dinner tomorrow too. After dinner I decided to use up some of the figs and peaches by stewing them with some cinnamon and ground ginger then topping with a mix of toasted oats and nuts mixed with a little coconut oil. As a quick and easy crumble, this was really good but I couldn't help thinking it would be better topped with lashings of custard. So it's been a full week now and I feel pretty good, but it's not an astounding difference. 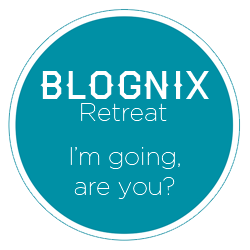 I'm really pleased to have stuck to the plan so far but also quite looking forward to it being over. I really want to stick to planning my meals in advance and eating lots of healthy fresh food, so I'm going to spend some time this week planning some other meals in for beyond Tuesday. Once the plan is over my boyfriend and I are going to cook together to celebrate and I quite fancy something spicy so I'm off to bed with a cookbook to see what I can come up with. Hope you all had a great weekend! Motivation: 8/10 - Probably just really excited to finish the plan now! Stomach: 9/10 – No complaints this evening despite a few rumbles post-yogurt. Energy: 8/10 – I'm tired, but in a good way, the way you are after a run and the company of good friends and an evening eating stew and crumble in front of Downton Abbey.